Wildlife Control - McGough's Inc. Wildlife Control – McGough's Inc.
One of the many advantages of living in Northern Michigan is our proximity to nature and its inhabitants. On occasion, however, the local wildlife can become a problem, invading our homes and garages, damaging our flower and vegetable gardens, and ruining our trees and shrubs. We at McGough’s understand the damage these animals may cause, but we also understand their importance to the world around us. This is why we carry a number of safe and humane solutions to deter or remove animals, including deer, rabbits, squirrels, moles and mice, chipmunks, skunks, and raccoons. 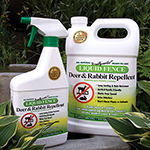 Liquid Fence Deer & Rabbit Repellent is the environmentally safe and biodegradable solution to all your deer and rabbit problems. This easy-to-use, long lasting spray is family and pet friendly. All natural formula that doesn’t hurt deer, rabbits, or your pets. A natural repellent for use on fruits, vegetables, and ornamentals. Even stops animals from chewing wood structures and fences. One application can last up to 4 weeks. Made from hot cayenne peppers. Locally developed and tested by Michigan State University, Green Screen® is a scent-based product that will effectively deter deer and rabbits, will not damage plants, and is safe for the environment. No mixing or spraying is required. It can be used during any weather, and is safe for ornamentals and edible crops. Protect your landscaping and gardens from deer and rabbits with Deer Scram, a scent-based repellent. Deer Scram contains all natural organic materials that won’t harm humans or pets. It contains no chemicals and requires no special handling or protection during application. When birds or deer are a problem in your berry bushes or garden rows, try using a physical barrier to discourage them. 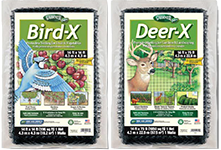 Bird-X & Deer-X mesh netting is available in several sizes to suit your specific needs. 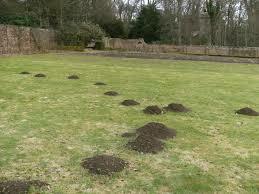 This mole trap has proven its worth in lawns, gardens, and golf courses all over the U.S. The “Easy-Set” Mole Eliminator® is the most effective mole control device available. It is easy to use and designed for safe operation.